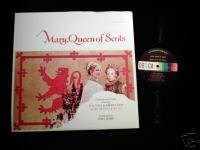 Decca Stereo LP DL-79186 (1971) Mary, Queen of Scots: Original Sound Track Music composed by John Barry; vocal on Vivre et Mourir by Vanessa Redgrave. Vinyl is near mint. Cover is Excellent, with a small red "Sample Copy" sticker on the back, slight ring wear, and the beginning of a 1.5" seam split on the top.